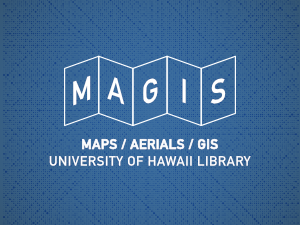 The Maps, Aerial Photographs, and GIS (MAGIS) collection is the largest collection of cartographic materials in Hawaii with over 300,000 items. Resources range from early to modern maps, aerial photography, and geospatial data. Coverage is worldwide with emphasis on Hawaii, Asia, and the Pacific. A selection of our materials has been digitized and is available from our map and aerial repositories. The Map Collection contains topographic and bathymetric maps, nautical and aeronautical charts, geologic maps, city and travel maps, early and historical maps, fire insurance maps, and numerous thematic maps. The Aerial Photographs Collection contains images from the USGS, USDA, US Navy, and NOAA flight lines flown over Hawaii and islands throughout the Pacific, mainly from the 1940s to the late 20th century. UH students, faculty, and staff have access to a GIS lab and software for designing maps, analyzing spatial and statistical data, and preparing data visualization for projects or research. Numerous tutorials for beginners, as well as experienced users, are available on all aspects of learning the software and spatial analysis methods. Only a small portion of the Map Collection has been cataloged and included in the library’s catalog and an even smaller selection has been digitized. Persons interested in either historical or current geographic information are encouraged to visit the MAGIS guide or contact the MAGIS staff to learn about the full range of materials available. As the stacks are closed and the collection is not available for browsing, please let us help you by making an appointment to discuss your research needs. For more information, please, visit the Map, Aerial Photographs, and GIS (MAGIS) website.